The LU-2200N/W-7 Series, JUKI's top-grade line of unison-feed lockstitch machines equipped with automatic thread trimmers, has earned a solid reputation for powerful feed, consistent sewing, and reliable thread trimming. In addition to the conventional 1-needle and 2-needle types, the LU-2200N/W-7 models provided with double-and 1.6-fold-capacity hooks have now been launched to fill out the Series. Furthermore, the AC servomotor/control box has been totally redesigned. The extensive variety of models in the LU-2200N/W-7 Series offers you the optimal choices for your sewing needs. The LU-2200N/W-7 Series has been designed for improved operability by providing a higher lift for the presser foot and easy adjustment of the amount of alternating vertical movement of the walking foot and presser foot. With its outstanding responsiveness in the sewing of heavy materials such as car seats and sofas, the machine guarantees increased productivity and upgraded quality. Thanks to its remarkable feed efficiency and improved feed cam unit, the machine smoothly feeds materials at high speeds while preventing stitch gathering. The machine is also equipped with a new box-type feed locus that enables the production of beautifully finished seams free from material flopping. The vertical strokes of the presser foot and walking foot (their alternating vertical move-ment) can be easily changed using a large dial mounted on the top surface of the machine head. 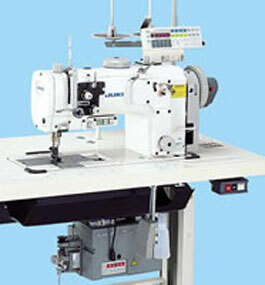 In addition, the sewing speed is automatically adjusted with the set value. With this feature, ideal sewing conditions are maintained at all times. The machine is equipped as standard with a pneumatic auto-lifter. The lift of the presser foot is 16mm, allowing the operator to handle the material under the presser foot with ease. The auto-lifter is controlled by a light-to-the-touch pedal, thereby helping reduce operator fatigue.